With KING’s next level satellite antenna technology, your choice for satellite TV is clear. Make any outdoor event more entertaining with the re-engineered DISH® Tailgater® Pro, a fully automated premium HD satellite TV antenna – including our ultramodern new clear cover, an industry first. It’s simply better, by design. With the Tailgater Pro, enjoying your favorite HD or SD DISH® satellite TV service is easier than ever before. Ideal for RVers, sporting and outdoor enthusiasts, tailgaters, long haul truckers or anyone with an active mobile lifestyle, the Tailgater allows you to take your DISH satellite TV service with you anywhere in the continental U.S. Compatible with DISH HD Solo receivers (Wally®, ViP®211z, ViP®211k or 411). DISH satellite service required; add service to your home account or sign up for a simple pay-as-you-go monthly programming plan. 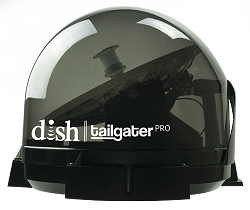 Now you can watch TV like a pro with the NEW DISH® Tailgater® Pro. Introducing the state-of-the-art redesigned DISH® Tailgater® Pro with the first ever ultramodern clear cover. It’s simply better, by design. Enjoy live HD DISH® satellite TV wherever the fun takes you with the Tailgater Pro premium satellite TV antenna. Designed for sporting events, outdoor enthusiasts or even owners of a second home, the DISH® Tailgater Pro is ideal for enjoying all your favorite TV programs anywhere, anytime. The DISH Tailgater Pro’s flexible design is ideal for portability or roof-mounting. It is fully automatic and works right out of the box when connected to a compatible DISH® HD Solo receiver. The award-winning design includes an exclusive interactive on-screen display for hassle-free set-up for DISH programming. The Tailgater Pro supports multiple TV viewing, so you can stay current on more than one show or live event. And, there’s no monthly contract to tie you down. With the DISH® Pay-As-You-Go plan, you pay only for the months you use. If you already have DISH at home, just add the new receiver to your account. Enjoy your favorite TV programming anywhere, anytime. This is the future of satellite antenna technology. Get tuned in, in no time with the DISH® Tailgater® Pro – the clear antenna choice for satellite TV. 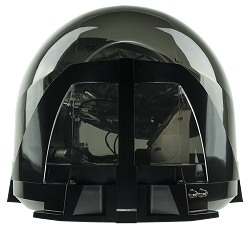 KING’s newly redesigned, enclosed-style, fully automated premium satellite TV antenna offers improved antenna design and a clear dome to boost signal strength. It’s ideal for RVers, sporting and outdoor enthusiasts, tailgaters, long haul truckers or anyone with an active mobile lifestyle. We’re reinventing the satellite industry through simple, creative design. At KING, we’re always looking for ways to serve our customers better. 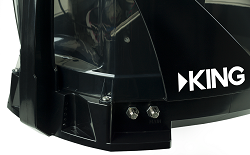 With the DISH® Tailgater® Pro, we are introducing an enhanced industrial design and our new ultramodern, clear cover – an industry first. You have to see it to believe it. You’ll love the sleek new look and enjoy the improved signal that comes with this redesign. Trees blocking your line of sight to the satellite? Tailgater Pro lets you know. The clear cover allows you to see exactly where your dish is pointing to simplify troubleshooting and ensure you’re receiving the best signal. Portable or roof-mounted? You decide. Portable and lightweight, the DISH® Tailgater® Pro can sit on the ground or on an optional tripod, or it can be permanently mounted to the roof of your RV, trailer or truck (no additional mounting brackets required). The Tailgater Pro allows you to take your DISH® satellite TV service with you anywhere in the continental U.S., so don’t leave the world behind on your next adventure. Set up is a snap with the no-hassle DISH® Tailgater® Pro. All you need is a clear path to the south. We’ll do the rest. Weighing only eight pounds, the DISH® Tailgater® Pro is lightweight and compact, making it easy to transport. Once you connect your Tailgater Pro, the auto-aiming feature will automatically connect to DISH® satellites taking all the guesswork out of getting started. The award-winning design includes an exclusive interactive on-screen display for hassle-free set up using your receiver remote control, so you’ll be ready to watch DISH satellite TV in minutes. With no contracts and no extra fees, the pay-as-you-go plan from DISH® only bills you for the months you use. You may cancel the satellite service at any time, without penalty. Already have DISH at home? Just add the new receiver to your account for one bill. You’ll never have to be without TV again. Call DISH to see if local channels are available in your area. KING® now offers the best of both worlds – antennas and satellite TV service. We can help you choose the right programming, whether you need service at home or on the road. WHO IS IT FOR? WHAT DOES IT DO? The DISH® Tailgater® Pro premium antenna is ideal for any mobile use including RVers, sporting and outdoor enthusiasts, tailgaters, long haul truckers or anyone with an active mobile lifestyle. The Tailgater Pro allows you to take your DISH® satellite TV service anywhere in the continental U.S. You can use this product as a portable antenna or have it permanently mounted to the roof of your RV, trailer or truck. The DISH Tailgater Pro works only when stationary. You’ll never have to miss the big game, breaking news reports, or your favorite show while out and about. 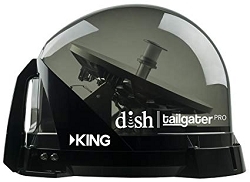 Like all of KING’s mobile satellite TV antennas, the DISH® Tailgater® Pro is great for camping, RVing, hunting, fishing, or at your backyard barbeque, second home, cabin, or ice fishing house. The portable and lightweight (weighing in at only 8 lbs. ), DISH® Tailgater® Pro offers a fast, effortless and reliable connection to your favorite HD channels from DISH®. Simply connect the Tailgater Pro premium satellite antenna to your compatible DISH receiver to power the antenna and transmit the HD video and audio signal to your receiver. You’ll receive 50’ of coax cable so you can be confident it will reach from your satellite antenna to your satellite receiver, wherever you go. Once powered on, simply follow the easy on-screen instructions. The DISH® Tailgater® Pro will automatically locate the DISH satellites, delivering access to HD channels in just minutes. If you are watching TV from your vehicle for more than a few hours, periodically run your vehicle to maintain battery life. For extended use, a portable power generator, power pack, or alternative accessory battery is recommended.